Whirlpool announced that it will cut 5,000 jobs in North America and Europe and shut down a factory in Arkansas. NEW YORK (CNNMoney) -- Appliance manufacturer Whirlpool Corp. announced Friday that it is cutting 5,000 jobs, mostly in North America and Europe, and closing a refrigerator factory in Arkansas. Whirlpool also cut its profit forecast for the year. The triple whammy of bad news sent the company's shares plunging 14%. The job cuts amount to 10% of the company's workforce in Europe and North America. Whirlpool (WHR, Fortune 500), based in Benton Harbor, Mich., said it plans to shutter its plant in Fort Smith, Ark., by mid-2012. That means that about 1,000 workers -- including 884 paid by the hour and 90 on salaries -- will lose their jobs. In addition, 800 other workers have already been laid off from the factory. Whirlpool Chief Executive Jeff Fettig blamed the job cuts on weak demand and higher costs. "During the quarter, we experienced weaker-than-expected global industry demand and elevated material costs," he said in a statement. The Fort Smith factory is being closed because of declining demand for its side-by-side refrigerators stemming from continued weakness in the economy, the company said in a press release. Whirlpool also cited "aggressive" low prices from overseas competitors. Whirlpool cited a preliminary ruling by the U.S. Commerce Department that South Korean companies LG Electronics and Samsung Electronics "dumped" low-cost refrigerators made in South Korea and Mexico into the U.S. market. Samsung and LG did not immediately respond to requests for comment. On Whirlpool's Web site, its side-by-side refrigerators retail for about $1,000. Whirlpool, which employs 23,000 workers in the United States, said the production of refrigerators will be shifted to its factory in Ramos Aripe, Mexico. The manufacturing of trash compactors will shift to Ottawa, Ohio, and the production of built-in refrigerators will shift to Amana, Iowa. Vernier said that 30 jobs will be added in Ottawa as a result of the shift. The town of Amana has felt the sting of job cuts in the recent past. Whirlpool cut 440 jobs in Amana in 2008, where the appliances bear the name of the town. The company is also consolidating some of its European manufacturing business, shifting dishwasher manufacturing from Germany to Poland in January 2012. Through these job cuts and manufacturing consolidations, the company plans to save $400 million annually by the end of 2013. 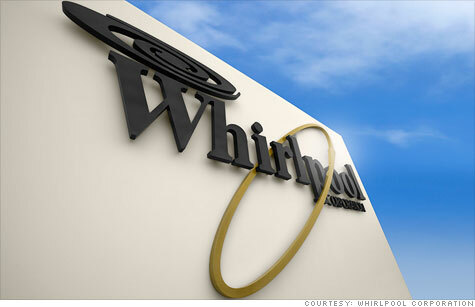 Those savings, combined with price increases, are expected to widen profit margins starting next year, said Whirlpool. But there will also be additional costs from the restructuring, totaling $500 million, according to the company. Whirlpool lowered its earnings outlook for 2011 to a range of $4.75 to $5.25 per share, compared to its prior outlook of $7.25 to $8.25. This puts more pressure onto an already dismal job market. While hiring picked up in September nationwide, the unemployment rate remains stuck at 9.1%.